Armed police have detained two men in an operation linked to an explosion in a restaurant in Exeter. Officers targeted the men at a cafe in the Old Town Street area of Plymouth. One man was arrested and the other is described as "helping police". 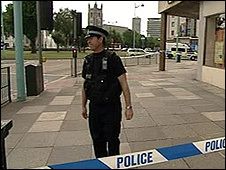 The operation is linked to Thursday's explosion in Exeter, for which Nicky Reilly, 22, has been arrested. Tony Merrick, who works nearby, told BBC News: "There were about 25-30 officers in 10 vehicles. "They sealed off the area and two men in the cafe were surrounded." Rebecca Pope, 25, who was looking out of a window above the cafe, said the two men were put in paper suits before being taken away in unmarked cars. BBC Home Affairs correspondent Daniel Sandford says Mr Reilly became known to officers because he was close to a group which police had been gathering information on. It is also understood Mr Reilly received a text message before he travelled to Exeter, which could be significant to the investigation. Our correspondent said the devices contained nails, drain cleaner, kerosene, an organic oil and aluminium foil. He added that it is not yet known if the explosion was caused by a deliberate or accidental detonation. Officers later revealed Mr Reilly, who was injured in the blast, had a history of mental illness. Deputy Chief Constable Tony Melville said on Thursday evening police believed Mr Reilly had adopted the Islamic faith and had been "preyed upon" and "radicalised". However, Devon and Cornwall Police have not since elaborated on these claims. 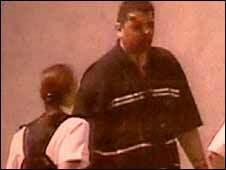 Neighbours of Mr Reilly have told BBC News he converted to Islam and changed his name to Mohammed Rasheed. The explosion took place at about 1250 BST. 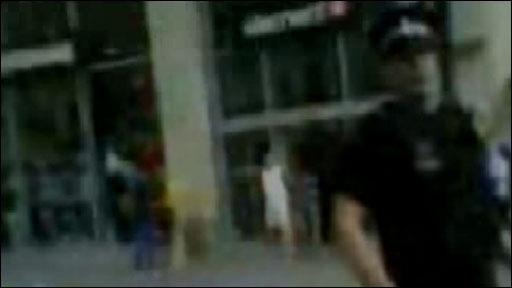 He was taken to hospital following the explosion where he remains under police guard. Police investigations are continuing at the flat, while the cordon at Old Town Street has been lifted.